Every day, events in our lives repeat themselves. We call them cycles. Our cycles work just like the sun rises every morning and sets every evening. 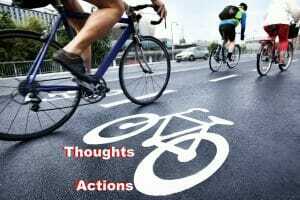 We all have daily cycles of thought and action. Some cycles work for us, while others don’t. Because these cycles repeat themselves, we can expect tomorrow to be like today if we don’t change the cycle. So if you want to change your daily results, start with your repeating cycles. Focus on creating routines now so that your important tasks are repeated daily. Start with a small action to break the cycle and build up from there. If you act wisely today, you’ll be more likely to do it tomorrow. However, if you do not act wisely today, you’ll be less likely to do it tomorrow. Our cycles matter because they take us places! So when you consider how you feel about a cycle today, also consider how that cycle will impact tomorrow. Are your cycles taking you where you want to go? What secret rewards am I getting from staying in this cycle? How is this cycle hurting me right now? When you make even a small change in a cycle, the cycle is no longer the same. Because you have done something different, your cycle is now different. You have taken the first step to breaking the cycle. With each change, get excited because you are changing – day by day! Excellent wisdom. Thank you for giving this perspective.